Feeling happy to share an inspired note from along the sidelines of the ongoing 114 day Sema event at a small Dargah in a town named Yalowa in Turkey where Sufi musicians and seekers from all over the world have gathered to deepen their practices and meet like-hearted seekers. For an astounding 114 days, musicians are offering sacred music (mainly from the Sufi tradition yet also open to music from all traditions) while about a dozen dervishes (ranging from sincere practitioners to beginners) perform their sacred whirling. That people here are welcoming of music from all traditions is evident when you hear a Devi chant at 4 am or a Chaap Tilak at 2 pm or Persian singers singing Hafiz poetry in the Sema. Inspired by accounts of Rumi holding similar gatherings 800 years ago in Konya, pre-decided small teams of musicians offer sacred music every hour, 24 hours a day for a marathon 114 days. As the music stirs deep devotion in the hearts of it's listeners, people are continuously whirling to the music (even at 2 am). When they get tired, people are welcome to sleep along the periphery of the large hall where the music is playing or in tents on the property around the dergah. Healthy meals are served thrice a day to all who are present reminding me very much of the spirit of the kitchen at the Golden Temple. On a daily basis the Dergah have about a 100 guests who stay for a period of between a day to a month. The entire operation (including cooking, cleaning, maintaining discipline, coordinating musicians etc) is managed by a team of volunteers who work day and night in shifts to offer a spiritual ambiance par excellence. And if all this is not amazing enough of a gift, the Sema is run completely in the spirit of gift pretty much like the Vipassanna system where guests can contribute whatever their heart feels in an anonymous box towards the day to day expenses. 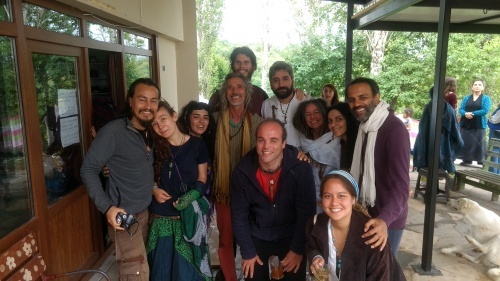 Today morning, I was joyfully invited by a deeply spiritual couple Franco and Glau from Brazil to join a spontaneous group of folks from over 10 countries to jam together and co-create a song infusing it chants and prayers from all our traditions. What came out of the jam was an hour long recording with diverse languages and we named it "Song of Celebration". Here is a short bootleg recording that someone took on their mobile of the same which I am sharing in the hope that it makes you sing your heart out too.